Pretty much every successful website has a recommendation engine these days. It is integral to know how to implement one! As discussed in my earlier article, sending recommendations to users buying anything is very crucial. And if set up and configured properly, it can significantly boost revenues, CTRs, conversions, and other important metrics. Moreover, they can have positive effects on the user experience, as well, which translates into metrics that are harder to measure but are nonetheless of much importance to online businesses, such as customer satisfaction and retention. Amazon uses recommendations as a targeted marketing tool in both email campaigns and on most of its websites pages. Amazon will recommend many products from different categories based on what you are browsing and show you the products that you are likely to buy, like the "frequently bought together" option that comes at the bottom of the product page to lure you into buying the combo. This recommendation has one main goal: increase average order value, i.e. to upsell and cross-sell customers by providing product suggestions based on the items in their shopping cart or below products they’re currently looking at on-site. 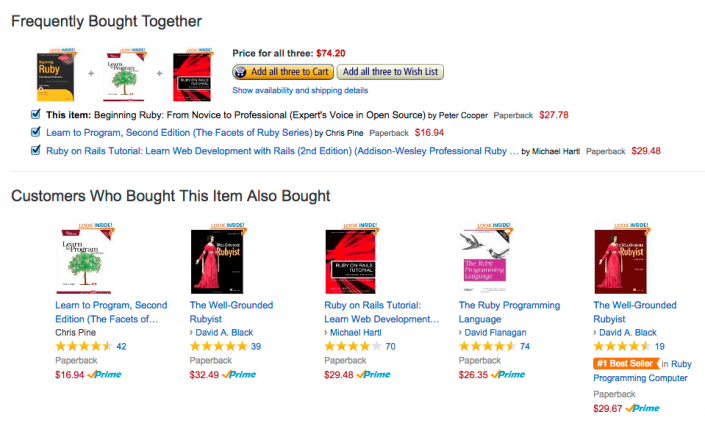 How Can You Implement a Product Recommendation Engine? You do not need a market research to find out whether a customer is willing to purchase at a shop where they’re getting maximum help in scouting the right product. They’re also much more likely to return to such a shop in the future. To get an idea about the business value of recommender systems: A few months ago, Netflix estimated, that its recommendation engine is worth $1billion yearly. Revenue: With years of research, experiments, and execution driven by Amazon, not only is there less of a learning curve for online customers today, but many different algorithms have also been explored, executed, and proven to drive high conversion rate vs. non-personalized product recommendations. Customer satisfaction: Many times, customers tend to look at their product recommendations from their last browsing, mainly because they think they will find better opportunities for good products. When they leave the site and come back later, it would help if their browsing data from the previous session was available. This could further help and guide their eCommerce activities, similar to experienced assistants at brick and mortar stores. This type of customer satisfaction leads to customer retention. Personalization: We often take recommendations from friends and family because we trust their opinion. They know what we like better than anyone else. This is the sole reason they are good at recommending things and is what recommendation systems try to model. You can use the data accumulated indirectly to improve your website’s overall services and ensure that they are suitable according to a user’s preferences. In return, the user will be placed in a better mood to purchase your products or services. Discovery: For example, the “genius recommendations” feature of iTunes, “frequently bought together” of Amazon.com makes surprising recommendations which are similar to what we already like. People generally like to be recommended things they would like, and when they use a site that can relate their choices extremely perfectly, then they are bound to visit that site again. Provide reports: This is an integral part of a personalization system. Giving the client accurately and up-to-the-minute, reporting allows for making solid decisions about a site and the direction of a campaign. Based on these reports, clients can generate offers for slow-moving products in order to create a drive in sales. There is more advanced and non-traditional methods to power your recommendation process. These techniques namely deep learning, social learning, and tensor factorization are based on machine learning and neural networks. Such cognitive computing methods can take the quality of your recommenders to the next level. It’s safe to say that product recommendation engines will improve with the use of machine learning and create a much better process for customer satisfaction and retention.